Dgw2.0 firmware can be downloaded from Media5 Support Portal. If you do not have an account to access Media5 Support Portal, please contact your Mediatrix product dealer or Media5 TAC if you have an SLA contract. Before starting to use these configuration notes, complete the following table to make sure you have the required information to complete the different steps. The Mediatrix unit must be reinitialized to its factory default settings to make sure the configuration can be successfully executed. IP address used by your Mediatrix unit to communicate with the Management Interface. If your Mediatrix unit is configured to use a DHCP server, use the DHCP server- provided IP address. If 3CX was installed on a Windows server using the default settings and folder, go to C:\ProgramData\3CX\Instance1\Data\Http\Templates\gateway, or locate the 3CX templates folder in your system and open it. 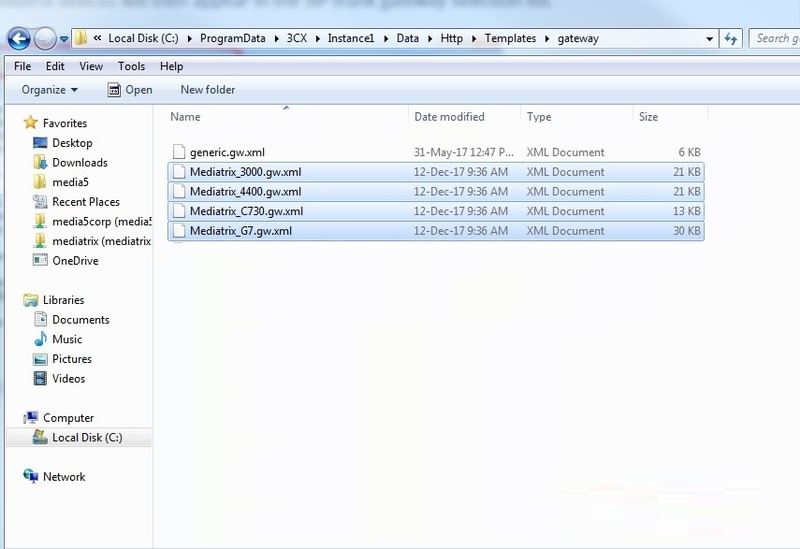 Copy the Mediatrix gateway templates in the gateway folder. Click CTRL + F5 to refresh your browser. You do not need to restart the 3CX server. The Mediatrix devices will then appear in the SIP trunk gateway selection list. In the 3CX Web interface, click SIP Trunks , located on the left-hand side of the window. In the SIP Trunks section, click + Add Add gateway . In the Add PSTN gateway dialog box, from the Select Brand selection list, choose Mediatrix . From the Select model/device selection list, choose your unit model. Enter the Main Trunk Number . The Adding the Mediatrix FXO, E1-T1 or PSTN Gateway to the 3CX Server step must be completed. In the 3CX Web interface, under the General tab, in the Enter name of trunk , type the name of the Mediatrix device. From the Registrar/Server/Gateway Hostname or I field, enter the static IP address of the Mediatrix Uplink port. From the Tone Set Selection selection list, choose your country. 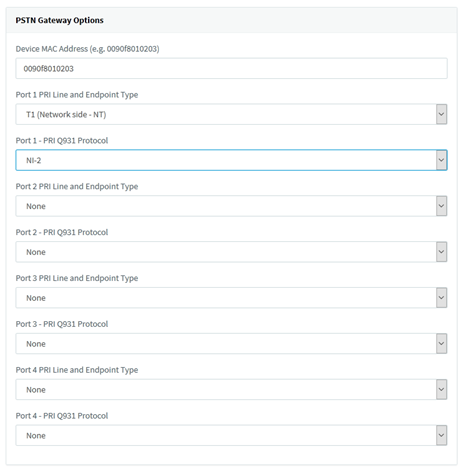 Enter the Number or Physical PSTN ports on device (e.g. number of PRI ports or FXO ports on the Mediatrix gateway). In the Type of Authentication field, choose IP-based or Register/Account based , depending on your set-up. For inbound call handling (from gateway towards 3CX), define how incoming calls are handled in the Routing of Calls to Main Number section. (In this example, all incoming calls are forwarded to extension 100). The Configuring the FXO or E1-T1 Mediatrix Gateway in 3CX step must be completed. In the SIP Trunks section, double-click on the gateway that you have just created. In Mediatrix gateway configuration window, select the Options tab. In the PSTN Gateway Options section, located at the bottom of the page, enter the MACaddress of the Mediatrix unit. The MAC address of the device is used in the filename of the configuration file created by 3CX. Refer to Locating the MAC Address of Your Mediatrix Unit . 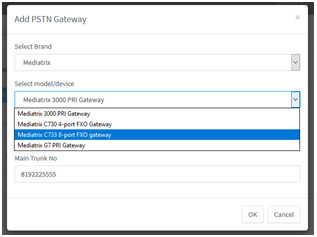 The following is an example for the 3000 series and G7 PRI gateway configuration parameters. For better performances, it is recommended to use the latest available version of Microsoft Internet Explorer, Google Chrome, or Mozilla Firefox. You may not be able to log on to the Mediatrix unit Web interface if you are using older browser versions. The computer's network card must be on the same subnet as the Mediatrix unit. In your Web browser, enter the IP address at which the Web interface of your Mediatrix unit can be reached. If your network has an IPv4 DHCP server, connect the primary Ethernet port of the Mediatrix unit to the network (ETH1 port), use the provided DHCP server IP address. You can also connect your computer to the secondary Ethernet port of the Mediatrix unit (ETH2), use the 192.168.0.10 IP address. Enter admin as your username and administrator as the password. You can also use public as a username and leave the password field empty. it has the full administration rights by default. The Information page of the Web interface is displayed. In the Network Interface Configuration table, from the Link selection list located next to Uplink , leave the default value. From the Type selection list, select IpStatic (IPv4 Static) . The Uplink Network Interface must be set with a fixed public IP address for the NAT/router to be able to do port-forwarding to the unit. It will also be easier for the PBX to communicate with the unit if the address is static. In the Static IP Address field enter the Uplink static IP address. In the Static Default Router field, enter the default gateway IP address. From the Activation selection list, select Enable . Click Apply to apply all changes to the configuration. Once the changes are applied, the connection with the unit might be lost. You may need to reconnect to the Web page using the new address. The unit can be reached (via the Web) with the Uplink static IP address . Connect a 10/100 BaseT Ethernet RJ-45 cable in the ETH1 port of the Mediatrix unit. Connect the other end of the 10/100 BaseT Ethernet RJ-45 cable to the Network. Go to Management /Configuration Scripts /Execute . If you are not using HTTPS, click Activate unsecure file transfer through web browser . 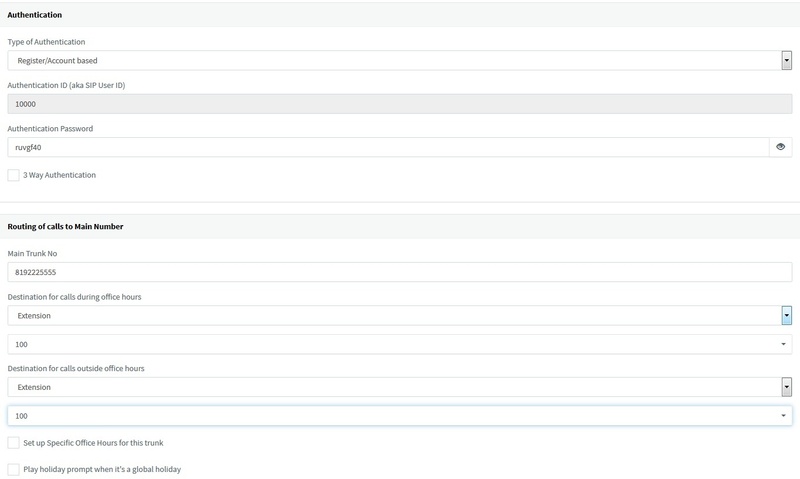 In the Upload Script Through Web Browser table, browse to the location of the file you wish to import. If the file is encrypted, complete the Privacy Key field. The privacy key must match the privacy key used to encrypt the file. Click Upload and Execute . Located at the top of the page, click Refresh . The configuration script will be imported from your PC and any changes to the script will be applied to the running configuration. This task is only required if Register/Account based was selected from the Type of Authentication selection list during the Configuring the FXO or E1-T1 Mediatrix Gateway in 3CX If Do Not Require- IP based was selected, skip this task. In the DGW Web Interface, go to SIP /Registration . In the Registrations page, check in the Status column if all ports are Registered . At this point you can test calls. Refer to the Testing Telephony Services technical bulletin at https://documentation.media5corp.com/ .